Located in a beautiful mission-style building in Costa Mesa, this building and location combination makes this one of the most desirable buildings in Costa Mesa. In addition to its location and design, the property boasts amazing amenities: free parking for tenants and visitors, serene gardens with beautiful water features, directly across from multiple restaurants and bars, on-site security, secure access and surveillance system, on-site parking, centrally located where the 55 Freeway intersects at Newport Boulevard, and more. 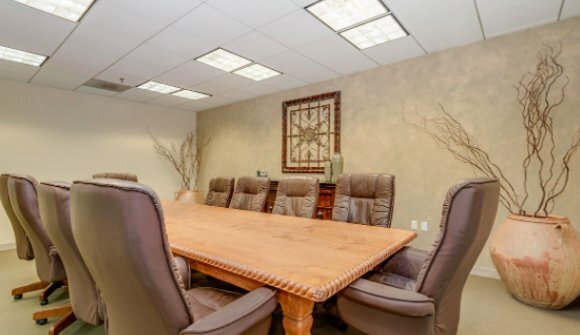 This location offers telephone, internet, administrative support, phone answering, meeting room services and more. 1901 Newport Boulevard – Suite 350 was acquired by Titan Offices in January of 2018. These offices for rent feature plug-and-play offices that are available for same-day move in! The space is furnished throughout with elegant and tasteful furniture in the reception area, office spaces, conference rooms, lounge area and break areas.